The headline tells the whole story. Angry parents, teachers drive Arizona school-funding debate. There should be no more waiting – it’s time for the governor to call a special session and #FundEducationNow. The article shared an experience one parent had attempting to contact her Republican lawmakers to express her concerns about some of the school funding choices – and she never heard back. Legislative Democrats are listening and we are angry too. That’s exactly why we’ve proposed a nearly $4 billion education funding plan that will help get money into schools immediately, while protecting future school funding sources. All of this can be accomplished without raising taxes and without taking money away from other priorities like DCS and university funding. 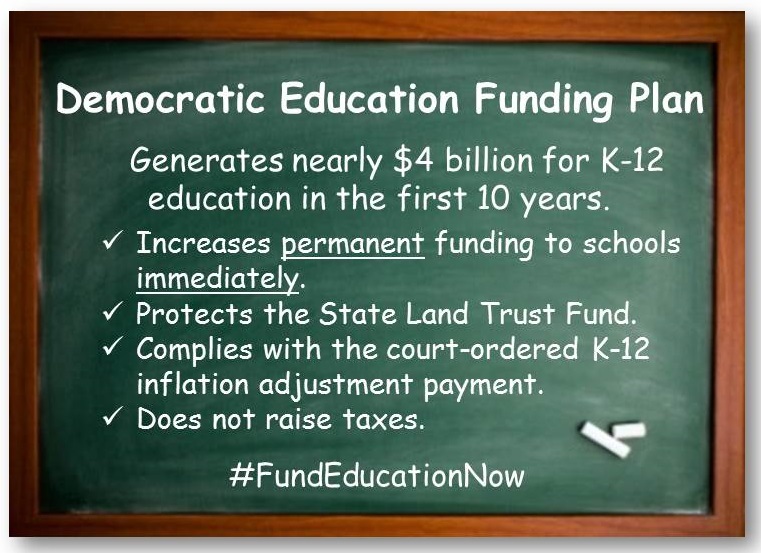 To learn more about the Democratic Education funding plan, click here. 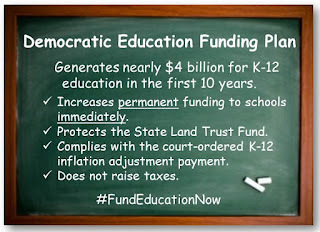 The governor’s plan forces voters to go to the polls and reassure the governor that education funding is a priority – again. This is a stall tactic. The voters have already spoken; they want money in schools now. This dicey plan also jeopardizes future education funding by dipping into the principal of the trust fund set up to support public schools. The Republican Legislative plan would defund the voter-mandated First Things First program – swiping resources from families. This is completely unacceptable as well. House Democrats are ready. We are ready for the governor to call a special session so we can get money into schools now. If you’re ready to make your voice heard, contact your legislators and the governor now and tell them to quit stalling. To find out how to do that, click here. And take this poll, so we can continue to make it clear that our schools, our kids and our future are our priority.